Access network traffic from the edge to the core. To detect threats in a network you need to provide the right data to the right security tools. For most security teams, there’s simply too little time, too few resources and too much data to efficiently find potential security threats. With the increased use of SSL encryption, network virtualization and security segmentation, how do you ensure that your tools are receiving all the right information and not being overloaded? The GigaSECURE® Security Delivery Platform delivers only the specific type of data required by security and monitoring tools to assess the network for threats. GigaSECURE, a next-generation network packet broker, generates metadata and optimized data packets specifically tuned to the security tool that is receiving it to boost threat detection efficacy across the enterprise. The GigaSECURE Metadata Generation capability includes NetFlow, a network protocol used to collect statistics on IP traffic information, such as IP source, destination of traffic, class of service and causes of congestion. NetFlow provides insight into traffic types and usage patterns across systems, enabling enterprises to catch denial of service attacks, data extraction and other events that represent a security risk. Save time and money by not sending raw data to analytics tools. Reduce false positives by separating signals from noise. Accelerate threat detection through proactive, real-time traffic monitoring versus reactive forensics. Reduce High CPU utilization issues in routers and switches. Although packet data contains valuable information, the exponential growth of data is causing tool overload. Detection tools, such as data loss prevention (DLP), intrusion detection system (IDS) and advanced threat prevention (ATP) tools, are unable to accurately assess all packets for threats. Flow Mapping® takes line-rate traffic and sends it through a set of user-defined map rules to security tools. Organizations can optimize tool performance and drive down costs. SSL/TLS Decryption helps manage increasing volumes of encrypted traffic. Organizations can ensure that tools focus on their primary functions while circumventing unnecessary appliance sprawl and related costs, complexity and the potential to introduce latency. De-duplication eliminates redundant packet information, speeding up forensics and malware detection and reducing the load required to store duplicate packets. Tools do not have to do decryption. SSL decryption does it better. Gigamon offers a next-generation network packet broker for security. The security experts have spoken. Read what your colleagues are saying in the 2018 Cyberthreat Defense Report. 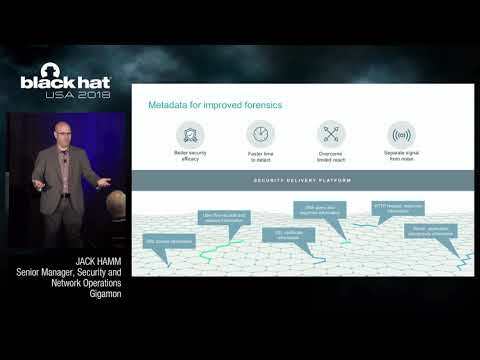 Learn how GigaSECURE uses metadata to accelerate threat detection. Automate and accelerate threat prevention, detection and mitigation. Use flow data to gain insights and take action.